Plastic wrap is a form of food packaging consisting of a thin film of flexible, transparent polymer that clings to itself and to food containers to form a tight seal. The plastic keeps the food fresh by protecting it from air and by preventing dry foods from absorbing moisture and wet foods from losing moisture. It also seals in odors to prevent them from spreading to other foods stored nearby. Plastics are artificial polymers; that is, they consist of gigantic molecules formed by combining thousands of small molecules of the same kind into a long chain. These small molecules are known as monomers, and the process of combining them is known as polymerization. Natural polymers include such familiar substances as silk, rubber, and cotton. The first plastic was made by the British chemist Alexander Parkes in 1862, who produced a substance he called Parkesine from cotton, nitric acid, sulfuric acid, castor oil, and camphor. Two years later in the United States John Wesley Hyatt improved this product and named it celluloid. Celluloid was a tremendous success and was used to make many different products, but it was highly flammable. The first completely artificial polymer (unlike celluloid, which was a derivative of the natural polymer cellulose) was Bakelite, which was produced from phenol and formaldehyde by the Belgian chemist Leo Baekeland in 1908. Many other polymers were developed during the 20th century, including such important products as artificial rubber and artificial fibers such as nylon. The first plastic used for wrapping was cellophane, another derivative of cellulose invented by the Swiss chemist Jacques Brandenberger in 1911. It had the advantage of being transparent, and was used for packaging as early as 1924. Cellophane was the most common form of plastic film made until 1963, when it was overtaken by polyethylene. Polyethylene was discovered by accident by research workers at the British company Imperial Chemicals Industries in 1933, when they mixed benzene and ethylene at high temperature and pressure. Polyethylene was first used chiefly for electrical insulating material. It was first made into a film in 1945 by the Visking Corporation in the United States, and has grown in popularity ever since. Polyvinyl chloride (PVC) was produced before World War II and was originally used as an inferior substitute for rubber, but films of this substance were not made in any quantity until the 1950s. PVC is used today in many different products such as pipes, flooring, electric cables, shoes, and clothing, as well as plastic wrap. 1952 it was offered to the public under the familiar trade name Saran Wrap. Most household plastic wrap is made from polyethylene, PVC, or PVDC. These polymers are all derived from simple hydrocarbons such as methane or ethylene, which are produced from natural gas or petroleum. Polyethylene is made directly from ethylene. PVC is made from vinyl chloride, derived from ethylene, or from acetylene, derived from methane. PVDC is made from vinyl chloride and vinylidene chloride, a derivative of 1,1,2-trichloroethane, which in turn is derived from ethylene or acetylene. Some plastic films, including cellophane, are derived from cellulose, which is obtained from wood pulp or from linters, tiny fibers that cling to cotton seeds after the longer cotton fibers have been removed by a cotton gin. At least one form of plastic film (Pliofilm, a trademark of Goodyear) is derived from rubber. 1 The chemicals needed to synthesize polymers are usually obtained from petroleum. Crude oil is heated in a furnace to about 752°F (400°C). Vapors from the oil move into a fractionating column, a tall tower containing a series of chambers. The chambers are warmer at the bottom of the tower and cooler at the top. The various substances that make up petroleum rise through the chambers as gases until they reach the temperature at which they become liquids. Since each substance has a different boiling point, they liquefy in different chambers and can be separated and collected. 2 Most polymers begin with very simple hydrocarbons that have low boiling points. These substances do not liquefy in the fractionating column, but instead remain in the form of gases which can be removed from the top of the tower. They may also be obtained from natural gas, which is mostly methane. Another source for these chemicals is naphtha, a mixture of liquid hydrocarbons, obtained from a fractionating column, which are heavier than gasoline but lighter than heavy oil. Naphtha is heated under pressure to break down the liquid hydrocarbons into smaller molecules, a process known as cracking. A catalyst is added to enable cracking to take place at a lower temperature and pressure than it would without it. The catalyst may be a natural or artificial clay (a mixture of alumina and silica or a zeolite (any of various minerals containing aluminum, silicon, oxygen, and other elements in combination with water.) Catalytic cracking usually takes place at a temperature of about 932°F (500°C) under a pressure of about 100 kilo-pascals. The cracked naphtha is then distilled in a manner similar to that in a fractionating column to separate its components. 3 Polyethylene is polymerized from ethylene, which is obtained from cracking. Ethylene is heated in a pressure chamber to about 338°F (170°C) at a pressure of about 200,000 kilopascals in the presence of a small amount of oxygen. The oxygen breaks the ethylene down into free radicals, which combine with each other to form chains of polyethylene. About one percent of a nonreacting gas such as propane is added to prevent the chains from becoming too long. 4 PVC is polymerized from vinyl chloride, which can be obtained either by mixing acetylene with hydrochloric acid or ethylene with chlorine. Ethylene is more commonly used because it is efficiently obtained from the cracking of naphtha. If acetylene is used it must first be synthesized by heating methane to about 2732°F (1500°C) or through various other chemical reactions. Vinyl chloride is mixed with water and agitated to form a suspension, much as oil and vinegar are mixed to form salad dressing. Various suspending agents such as starch and gelatin are added to keep the mixture from separating. The temperature of the suspension is raised to about 104°F (40°C) or 122°F (50°C) and an initiator, usually an organic peroxide, is added to start the reaction. The vinyl chloride molecules react with each other to form chains of PVC. The mixture is cooled and particles of PVC are separated from the water in a centrifuge and dried in an oven. 5 PVDC is polymerized from a mixture of about 15% vinyl chloride and about 85% vinylidene chloride. To produce vinylidene chloride, first 1,1,2-trichloroethane is made by mixing acetylene, hydrochloric acid, and chlorine, or by mixing ethylene and chlorine. The 1,1,2-trichloroethane then reacts with calcium hydroxide or sodium hydroxide to produce vinylidene chloride. Polymerization of PVDC proceeds in much the same way as PVC. 6 Polyethylene is naturally flexible, but PVC and PVDC must have plasticizers added or they will be hard and rigid. Various organic and inorganic esters can be used as plasticizers. Generally the liquid plasticizer is slowly sprayed into dry polymer powder and heated to about 302°F (150°C) to form a homogeneous mixture. 7 Plastic wrap is made by extrusion. In this process granules of plastic are heated until they melt at about 212°F (100°C) for polyethylene and about 392°F (200°C) for PVC and PVDC. The liquid is then forced through a die to form a tube of warm, stretchable plastic. At regular intervals compressed air is blown into the side of the moving tube to form large bubbles. This stretches the plastic to the desired thinness. 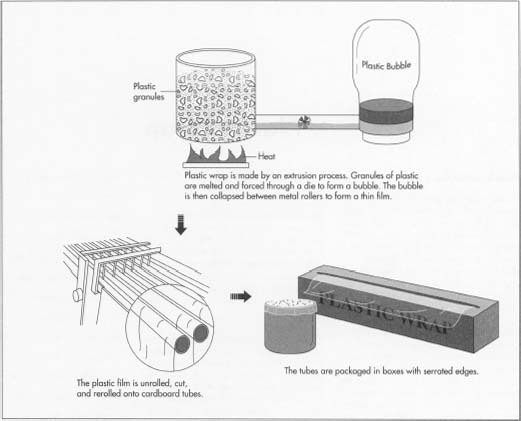 The thin plastic cools rapidly, and the bubble is collapsed between metal rollers to form a film. The film is wound around a large metal roller to form a roll that may hold several kilometers of plastic wrap. The plastic film on these rolls is then unrolled, cut to the proper length (usually about 49 feet [15 m]) and width (about 1 foot [0.33 m]), and rerolled onto small cardboard tubes. (This rolling, unrolling, and rerolling tends to give the plastic wrap a slight negative charge of static electricity, that helps it cling.) The cardboard tubes of plastic wrap are placed in cardboard boxes that have a serrated edge at the opening so that the consumer can tear off the desired length. Some also have a sticky spot on the box to catch the edge of the plastic wrap so it doesn't stick to the tube. The boxes of plastic wrap are then stacked in cartons and shipped to retailers. A variety of standard tests exist to ensure that plastic wrap is effective. The most important are tests for permeability, impact resistance, and tear strength. Water vapor permeability is measured by filling a dish with calcium chloride, a highly water-absorbent substance. It is covered with a sample of plastic wrap and weighed. The dish is then placed in a chamber with a controlled temperature and humidity. After a measured amount of time the dish is weighed again. The increase in weight shows how much water vapor has passed through the plastic. This test can also be done by filling the dish with water instead of calcium chloride and measuring the decrease in weight to see how much water vapor has escaped. These tests are performed at 73°F (23°C) with a relative humidity of 50%, at 90°F (32°C) with a relative humidity of 50%, and at 100°F (38°C) with a relative humidity of 90%. Gas permeability is measured by placing a sample of plastic wrap between two chambers. The upper chamber contains a pressure of 100 kilopascals, and the lower chamber contains a vacuum connected to a tube containing liquid mercury. As the air in the upper chamber passes through the plastic wrap it increases the pressure in the lower chamber and forces the level of mercury to drop. The change in the level reveals how much air has penetrated the plastic. Impact resistance is measured by dropping weights of increasing size on test samples until half of them break, at which point the weight is recorded. It can also be measured by filling bags made from the plastic wrap that is being tested with sand and dropping them on a hard surface from increasing heights until they burst. The height at which this occurs is then recorded. Impact resistance is also measured by shooting a small steel ball propelled by pressurized air through a sheet of plastic wrap and measuring how much the plastic slows it down. Tear strength consists of tear initiation strength (the force required to start a tear) and tear propagation strength (the force needed to continue a tear). To measure tear initiation strength a sample shaped like a shallow V is pulled between two jaws until it begins to tear. This unusual shape is selected to provide a 90 degree angle that provides a controlled starting point for the tear. Tear propagation strength is measured by pulling apart a sample containing a precut slit. In general, PVDC is stronger and less permeable than polyethylene, which is less permeable than PVC. Since plastic wrap is difficult, if not impossible, to recycle and is rarely reused, it does contribute to waste. One consumer group, considering such factors as the energy and raw materials needed for manufacture, the wastes released during manufacturing and disposal, the ability to be recycled, and the typical amounts used, has rated plastic wrap as "Good." By comparison, reusable plastic containers were rated as "Excellent," plastic bags as "Very Good," aluminum foil and freezer bags as "Good," and freezer papers as "Poor." Another concern is the possibility that exposure to certain plasticizers in plastic wrap could be harmful. These chemicals are absorbed from plastic wrap into hot and fatty foods. Although they have never been shown to cause harm in humans, plasticizers have been proved to cause cancer when fed in large amounts to lab animals. PVC wrap can consist of as much as one-third plasticizers, PVDC wrap consists of about 10% plasticizers, and polyethylene wrap usually contains no plasticizers. Gait, A. J. and E. G. Hancock. Plastics and Synthetic Rubbers. Pergamon Press, 1970. "Keeping Food Fresh." Consumer Reports, March 1994, pp. 143-47.